I received these items directly from Smoant for the purpose of review. Not gonna change my opinions... As always, I'm just this guy, y'know... YMMV. So, let's talk about airflow... When a tank is nestled into a little cocoon it's easy to imagine that airflow would suffer. If the tank being used is tight in the space, it likely will. A 22 mm tank in a 23 mm space gives enough room to allow air to get into the tank, though. However, Smoant thought of this issues, and provided a solution. There is a set screw in the platform of the 510 that allows it to be loosened, rotated, and locked to the airflow slots on most tanks remain unblocked. The set screw is a 1.5 mm hex. While looking at the 510, the center pin is spring-loaded and either gold plated or brass. The threads are stainless steel. Nice! Back to the top of the mod... There is an odd rubber dome opposite the tank enclosure. At first, it might be mistaken for a big, rubbery firing switch. It's not. It is a cover for the battery. Or, rather, the battery cap. 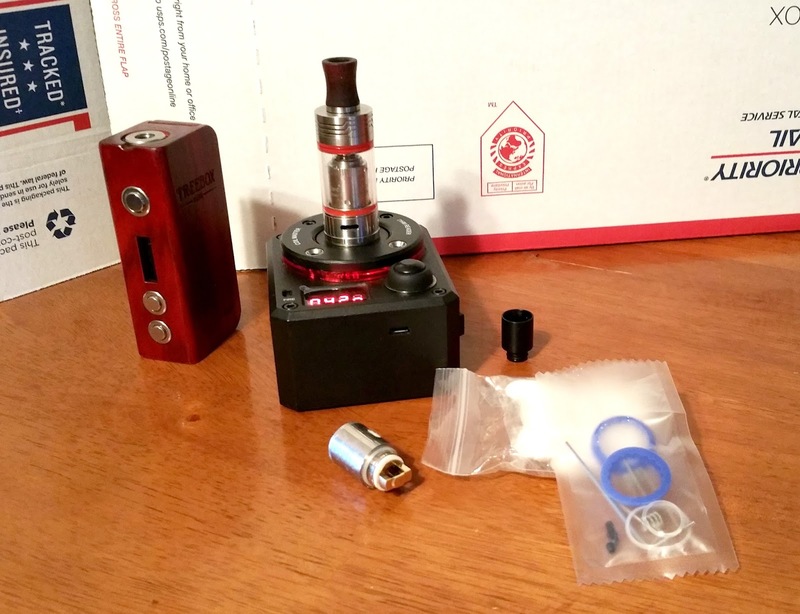 This device uses a cap on top similar to the caps found on the bottom of mods such as the VaporFlask or SX Mini. It's a thick disk with cutouts to either side allowing, almost, a decent grip. The exterior of the disk is threaded to screw into the device until a solid contact is made. The rubber cap covers the cap, and makes it a bit easier to install and remove. However, it is the cap and topper that give me cause to pause. The cap is the only battery ventilation. With the rubber stopper in place, the battery has, in effect, no venting. If, heaven forbid, a battery did start to vent, it would build up pressure in this space until the rubber cap was forced out. Of course, the device could be used without the stopper, but the venting is still pointing at the user's face. The battery side of the mod is kind of contoured - a little larger at the top and a little smaller all the way to the base. The device also widens out on either side about half way through the battery compartment. This makes the device incredibly comfortable in the hand. The little contour fits just perfect in the palm, next to the thumb, on either hand. My index finger wraps around and lay on the guard in front of the tank very naturally. My middle finger sets right on the firing button. My ring finger rests on the wattage adjustment buttons, and my pinky curls nicely underneath. On one side, near the bottom, but not on the bottom, is a USB connector which allows for onboard charging. On the other side is a small, but very bright screen. 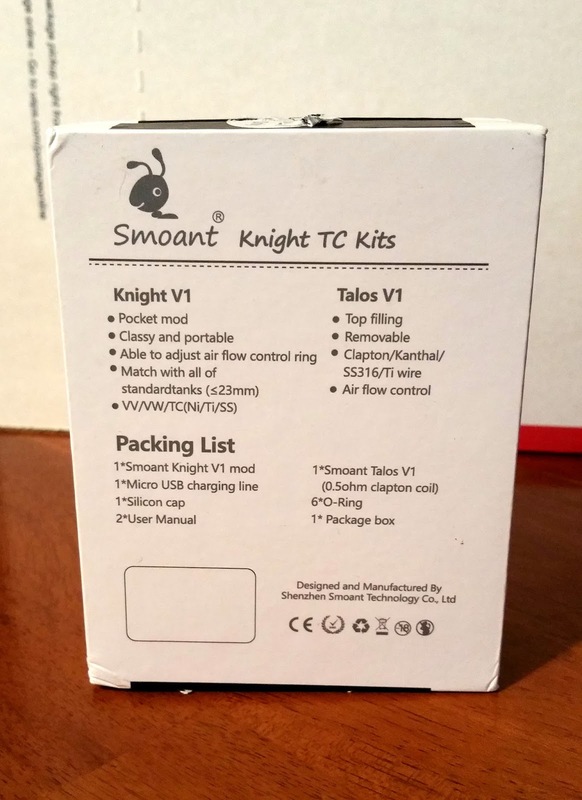 Beneath the screen is the only branding on the device "Smoant Knight V1." There is a panel inset into the front of the device that holds the angularly domed firing button, and, beneath that, two smaller BB-ish up and down buttons. All of the buttons are metal and I heard no rattle anywhere. The bottom of the tank has a "do not dispose" graphic, a CE logo, and the only two visible scres on the device (aside from the set screw in the deck of the 510). The mod comes in black or white. I received the white version. It appears to be a fairly durable, slightly pearlized enamel. I say "fairly durable" as the device did have two small chips in the finish inside the tank recess. Obviously where the tank had made contact. There were no marks on the tank. Further, the chips have not spread. I have not dropped or intentionally scratched the device to further test the durability of the finish, and I don't think I will. I do not know the manufacturer of the board used in the device. The screen is DNA-ish with some notable differences. From on side to the other (on mine, at present, this is from bottom to top, but the screen can be flipped), there is a battery strength indicator divided into 4 sections above two letters that indicate mode. I'm in VW mode right now. next to that is a larger set of numbers that displays either wattage, voltage, or temperature depending on the mode selected. Then there is a smaller two-line display that reads out the atomizer resistance over either the applied voltage (in VW mode), applied wattage (in VV mode), or the Joules (yep... Joules mode for TC). The devices menu is different from some others, but does not stray too very far and is fairly easy to learn and navigate. 5 Clicks of the Fire button turns the device on or off. 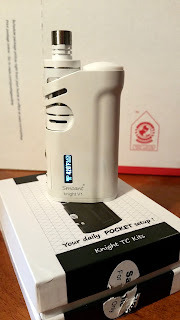 When the device powers on a two-part welcome screen displays first the Smoant logo, then the name of the device "Knight V1." The logo is an ant... not a bunny as another reviewer suggested. In use, the device is quite easy to use. I've tested the device using Ni200 and Ti, but have not yet used SS mode (I only have SS430 on hand and the device is tuned to SS316, and I didn't want to use the one SS316 coil head I had... sorry). 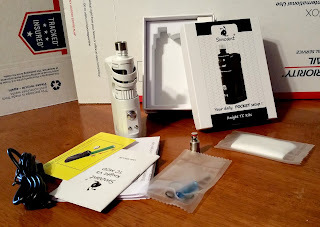 I've also used the device in Variable Wattage Mode and Variable Voltage mode. I do not have an oscilloscope, but it feels accurate compared to other trusted device. I got no burnt hits when using TC. Further, the device ramps up and fires quickly. At 35-40 watts, I am getting a solid 6 hours of vaping - at my pace, YMMV - using an LG HG2 Chocolate. Charging through the USB port takes about 6 hours from dead, but pass-through vaping is available. Along with pass-through, the mod is equipped with all the safeties we've come to expect: overcharge protection, undercharge protection, reverse battery protection, low atomizer protection, short protection, overheat protection, and over-time protection. Documentation states that the device will fire down to .1 and up to 3.0 Ohms (.1 - .3 for Ni200, .1 to 1.0 for Ti and SS). The device does lack TCR adjustments, and I can find no mention of a firmware updates. Which brings us to the tank included with the kit. It's called the Talos V1, and it comes with a .5 Ohm Clapton coil head rated to run between 25 and 45 watts. The tank also comes with an RBA head. The coils and the RBA might look a little familiar to some, and they should. They are compatible with the Kanger Subtank coils and the V2 RBA. In fact, aside from the lettering etched in the side, the RBA head is identical. The tank holds 4.5 ml according to the documentation. I did not measure it out with a syringe, but that feels about right.The airflow on the tank is about on par - maybe a little more open - with the Kanger Subtank Mini V2 as well. There are two cyclops style ports - one on either side - with a sliding ring. The ring is stopped by a peg at the end of the hole. Above the airflow ring - which has a series of shallow grooves cut in it - is a thin stainless steel ring, then the tank proper. The construction of the tank's glass section rather resembles the Joyetech Cubis in that it is a glass tank situated beneath a metal shroud with large windows on each side. Above that is another stainless steel accent, then the top cap. The top cap comes off to reveal two middling sized kidney shaped holes to fill the tank through. The top cap is topped off with a knurled protrusion that make it easier to install or remove the tank, or remove and attach the top cap. 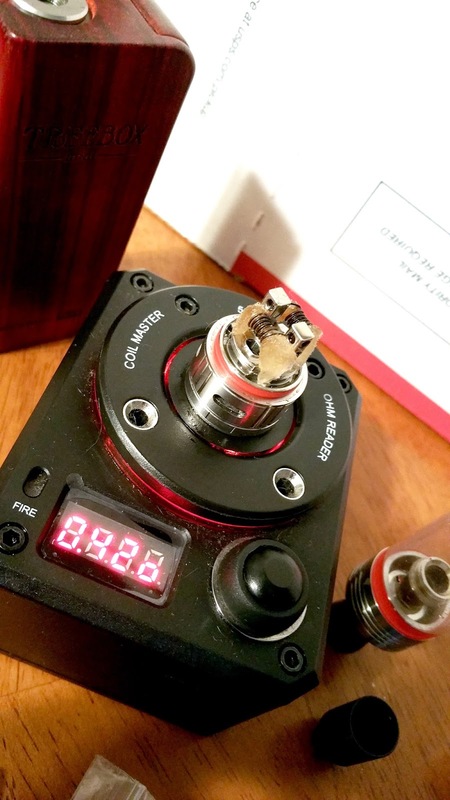 That knurled nubbin is actually a 510 compatible drip tip socket. The kit comes with a short stainless steel drip tip. It's actually a pretty nice looking tank. Easily on par with the Kanger Toptank Mini. maybe even a bit nicer. The finish on the tank perfectly matches the finish on the mod right down to the small, silvery wording "Smoant" above the glass window on one side, and "Talos V1" below. The flat, non-protruding 510 center pin is not adjustable. 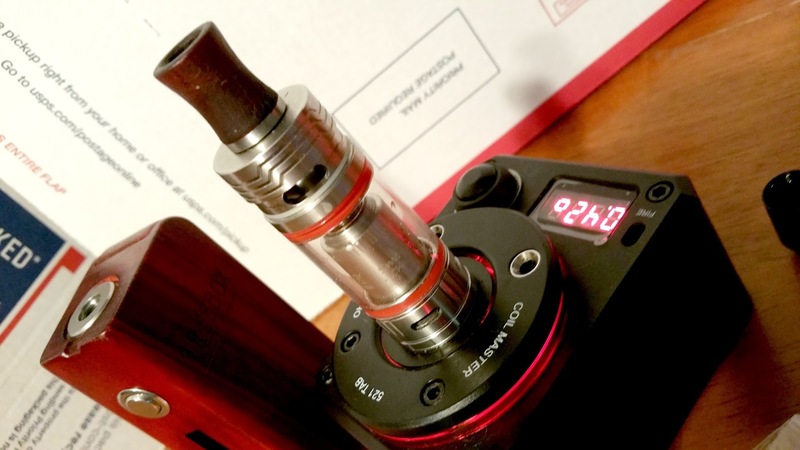 This tank should never be used on a hybrid device. 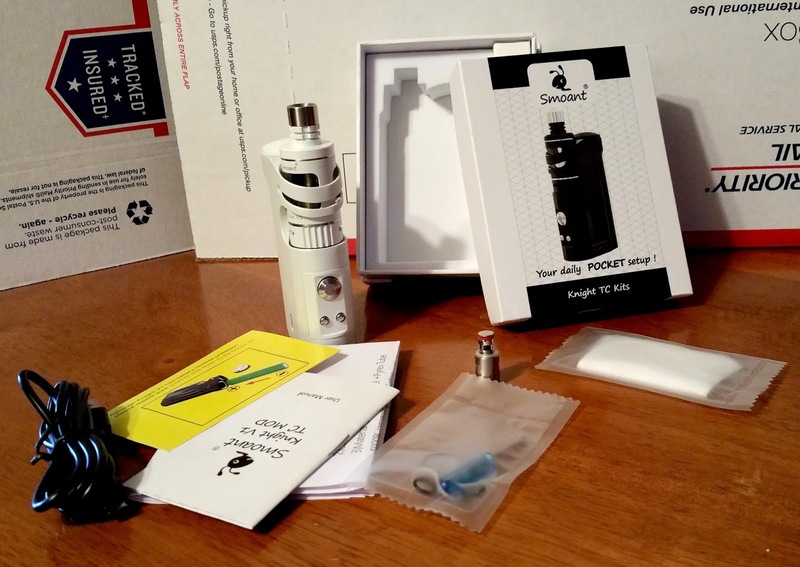 The kit is nicely packaged in a presentation box that also includes a full RBA kit (cotton, wire, screws, and a little blue screwdriver), a manual, and a USB cable. There is no wall wart. The kit is priced at $69.90. The tank by itself (also available in stainless steel) is priced at $25.90. Currently, I can only find them at Ave40.com. The other item that arrived is the Charon tank. There was no retail packaging for it yet, and so it was wrapped in bubble wrap, but still came with a dual SS316 coil, an RBA deck, and an RBA kit. Where the Talos tank is compatible with the Kanger Subtank, the Charon is compatible with the SMOK TFV4. Personally, I think this was a genius move as it will allow adopters of this tank access to dozens of coil options and five RBA options. Yeah... five. There are the single, dual, Clapton, and beast coil from SMOK and the very nice Velocity styled RBA head that came with this tank. Where the Talos borrowed some visual cues from the Cubis, the Charon has an OBS Crius sort of feel with a slide-up ring on top that reveals a sizeable fill port. This is also a design adopted by iJoy in their line of tanks. I like it. than its cousin the Talos, only holds 4 ml. The base of the glass is secured with a clear o-ring. I found that Kanger Subtank Mini o-rings could replace these, and a set of spares (in blue and clear) was also provided. Then there is the airflow collar which provides control over four medium sized airflow ports. The airflow ring, which has three grooves cut between each slot, will spin completely around, but is snug and will not shift easily on its own. Beneath that is the base which also has a series of grooves cut around it, and the 510 connector. The center pin is flat, does not protrude, and is not adjustable. Do I even have to say "do not use this on a hybrid device"? TFV4 fans will like this tank, and the price is not bad. Ave40.com has it in Stainless Steel and Black for $29.90. 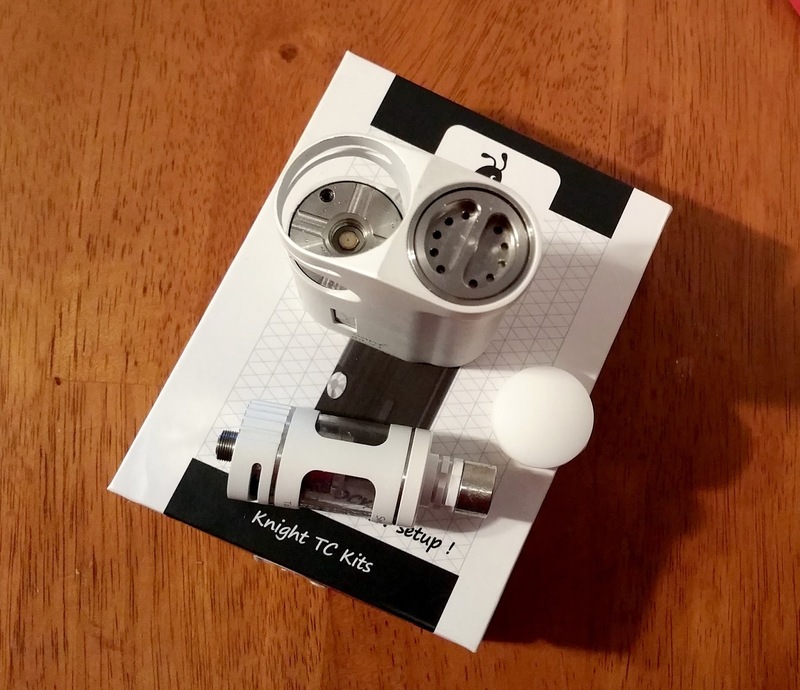 Throughout this review, I've mentioned other devices... there's been mention of the TFV4 from SMOK, the Crius from OBS, the Subtank Mini from Kanger. Some have said that the mod itself is a clone of the DNA40 XVO Stick. I have to say that I disagree. 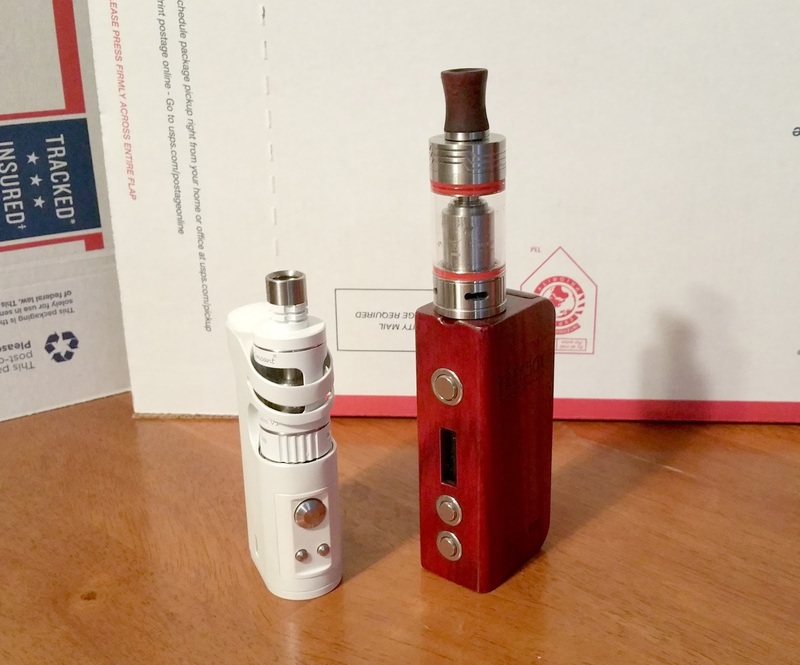 I can see the similarities and I would agree that the mod, and the tanks derived inspiration from these other products, but they are all stand alone products that have used perhaps the best elements from the others, and improved upon others. Honestly, the blue o-ring on top is driving me nuts... Other than that, this has been a stellar tank. Note that the pictures online do not show a blue o-rig, so it might have been changed. Remember that this was not a finished retail product when it arrived. Finish - 9/10 - Outstanding overall. I really like the feel, however, there were a couple dings inside the tank cage on the Knight V1. I could find no machine oil... a quick wash and rinse and we were in business. Form - 9/10 - As it comes in a kit, I cannot fault the nubbin on top of the Talos. It does not look bad and served a purpose. The devices look good and feel better. Some have complained about the rubber bung on the battery cap. It also serves a function, and is removable if it really really bothers. The only point I will knock off is the battery venting issue. Those vent holes need to be at the bottom of the device away from the users' face. Function - 9/10 - Pretty awesome, really. When used as intended, it's spot on perfect. I only wish that TCR adjustments were available and that firmware upgrades were possible. Final - 9/10 - A! If a solid, yet stealthy device is in consideration, this might well be the one. If a tank is needed to supplement or replace a TFV4 or Kanger Subtank, these will do the job nicely! I own this mod and have been using it about a month. Two things I would mention. One, supposedly you can take while it is charging. I don't generally do this but three times now I have hit the firing button while it was on the charger and they had started Auto firing. It stopped after 10 seconds, but I couldn't make it stop myself. Two, when I hold it, my index finger tends to block the tanks airflow. Other than these two points, I found it to be a good setup. The weight does not bother me, in fact it feels sturdy. And I like the looks. The Finish is holding up very very well. Glad you're enjoying. Sorry to hear you're having problems. I've not had the autofiring issue, and I would contact Smoant about it. As for the grip? I place my index finger over the guard and fire with my middle finger.